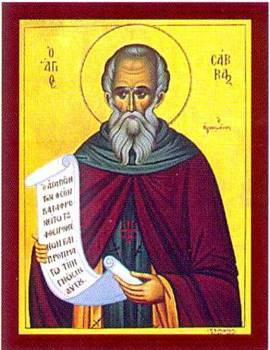 ST. SABAS, one of the most renowned patriarchs of the monks of Palestine, was born in the year 439, near Cæsarea. In order to settle a dispute which had arisen between some of his relatives in regard to the administration of his estate, while still young he forsook the world and entered a monastery, wherein he became a model of fervor. When Sabas had been ten years in this monastery, being eighteen years old, he went to Jerusalem to visit the holy places, and attached himself to a monastery then under control of St. Euthymius; but on the death of the holy abbot our Saint sought the wilderness, where he chose his dwelling in a cave on the top of a high mountain, at the bottom of which ran the brook Cedron. After he had lived here five years, several came to him, desiring to serve God under his direction. He was at first unwilling to consent, but finally founded a new monastery of persons all desirous to devote themselves to praise and serve God without interruption. His great sanctity becoming known, he was ordained priest, at the age of fifty-three, by the patriarch of Jerusalem, and made Superior-General of all the anchorites of Palestine. He lived to be ninety-four, and died on the 5th of December, 532.